I had a big batch of stout I made the other day. It was a repeat brew because the previous run of this recipe turned out great and I wanted more. So I was greedy and went for a big batch (targeting 5.5 gallons instead of 5). As a result, my fermentation bucket was pretty full, and pitching 2 pouches of yeast in there really got things going. 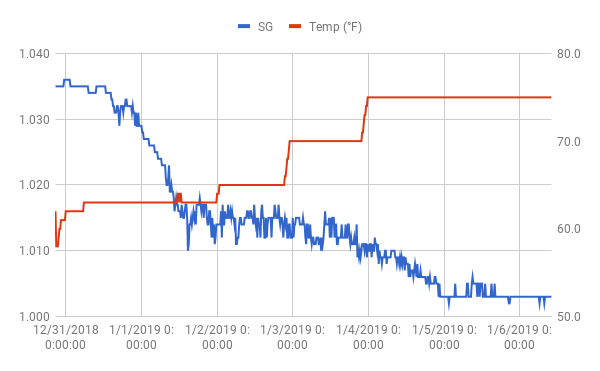 I was using my Cool Zone temperature control system from Gotta Brew to keep things cool to start off with and manage the active fermentation heat, and then utilize electric heater to raise temperature as I progressed farther along in fermentation. 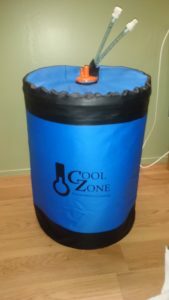 The Cool Zone comes with an insulated jacket to go around your bucket but let water & electric lines out to feed the cooling jacket and electric heater. I recall some advice I was given about not letting things get dirty in there because keeping things in the cool dark would breed nasty stuff (foreshadowing). 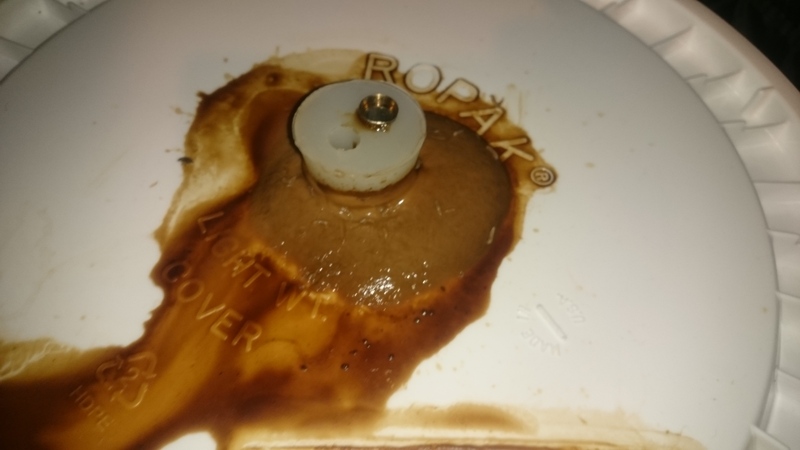 So a couple days in, my yeast had taken off wildly and my small headroom in the bucket plugged my 3-piece airlock and yeast foam started to come up from below. I switched over to a blow-off tube set-up, but I had already bubbled over onto the lid of the bucket. The words were echoing in my head about not letting things get dirty in there, but I was pressed for time, so I didn’t clean it up. A week and half later when I’m finished with fermentation and ready to transfer to a carboy for cold crashing, I notice a couple small flying bugs around my yeast mountain bubble over. As I pull the bucket out further, I see they’ve decided to lay some eggs on Mt. Yeastmore and I’ve got a group of tiny larvae wriggling around enjoying their yeast bed. It was disgusting. So definitely heed the advice and clean up any yeasty bubble overs since it’s too enticing for insects to pass up (apparently). 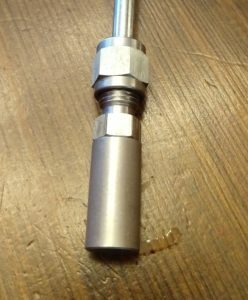 Every homebrewer has their own unique perspective on the hobby. Different reasons of why you got into the hobby, different parts of it that bring you joy, different parts you hate, and different things you want to get out of it. Some people started in homebrewing because they just wanted to make something of their own, and as long as it’s homemade, they don’t sweat the details. Some find joy in building their own mega-system, customized to their own design and made up of bits procured from homebrew shops, hardware stores, and obscure hobby websites. Others are just into developing the perfect recipe they’ve got trapped up in their head. The list can go on and on. When I first saw all-in-one brewing systems in the LHBS, I scoffed and said, “Who’d want to brew in one of those? 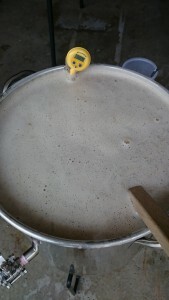 It takes all the fun out of it.” The guy working replied, “Well, unless your joy comes from the recipe creation process and working to perfect your recipes.” I was skeptical, but it did get me thinking about what my personal joy of homebrewing was driven by. I started my homebrewing life probably similar to many. I was really into beer, and the idea of making a hobby out of it, made it sound more sophisticated than just sitting around and drinking it. It was fun, but the lackluster results left me struggling to justify why I should go through all the trouble just to make 2 cases of mediocre beer when the beer store was overflowing with great options. 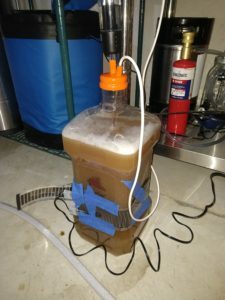 I plugged along in the love/hate relationship for several years with extract and partial mash brewing, never quite satisfied with the results. 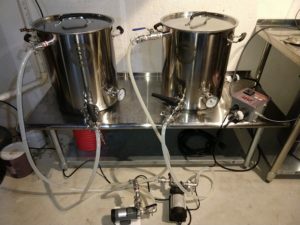 Before giving up on homebrewing altogether, I decided I’d give it one last shot and I invested in some all-grain equipment to see if it was all it was purported to be. It was a Eureka moment as the telltale extract sweetness was gone and I was enjoying the beer now and all the newfound control knobs to experiment with (grains, mash temperatures, process details, etc.). So after the words from the LHBS about all-in-one systems bounced around in my head for a few months, I started to see some merit in them. While some of the systems were marketed to appeal to extract brewers in an attempt to make the all-grain process seem less scary, for me it wasn’t about that. I was already all-grain brewing and loving it. Or at least most of it. Two things that nag me are process repeatability/control, and the length of time of my brew day. As an engineer, my whole brewing process is very detail-oriented. Starting from my recipe formulation on what exactly I’m trying to accomplish, what ingredients will best help me achieve that, and what aspects of the process I need to control. I write it all down in a detailed brew log notebook on brew day, and then I savor and analyze the results taking more notes on what I think worked, what didn’t, and what I should change next time. Here enters my 2 nagging problems. 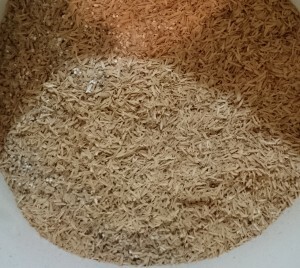 If I want to make that Pale Ale again, but tweak the malt flavor by modifying the grain bill, I want everything else to remain the same so I know if I was turning the right knob or if I should pursue some other change. But if I get largely varying mash efficiencies, or don’t have good control of mash temperature, I frequently find I’m changing more things than intended. Everyone’s life has its own list of things that keep you busy. For me, it’s being married and having 2 young boys. So trying to carve out an 8 hour chunk of time for brew day can be a challenge, and that means I can’t brew as frequently as I want. So when I do get a brew day planned, it’s a fight between going back to that Pale Ale recipe to try out my tweak or making that Dusseldorf Alt that popped into my head 2 weeks ago and I can’t stop thinking about it. If a ‘Brew Day’ could be morphed legitimately into a ‘Brew Afternoon’ or ‘Brew Night’, I’d have time to do both Pale Ale Version 2.0 and Dusseldorf Alt 1.0. In other words, I could develop my skills at brewing more quickly by being able to go back and really experience what the process and ingredient changes make in the finished beer. I’ve heard several people mention that it takes 3 attempts at brewing a given beer/recipe until you can get it dialed in at exactly where you want it. I definitely have had the same experience. More to come on my experiments on HomeBrewTalk.com in the near future as I compare multiple systems. If you’re grinding your own grains, you’ll find some grains need a different roller setting to get a good crush. If they’re all in the same bag you’ll risk getting some over-crushed, or some under-crushed. When they’re separated you can easily do a spot check to ensure you’ve got all of your grain bill, and if you so chose re-weigh it when you get home. I’ve gone over my order in the car before only to find a missing bag of something or a bonus bag of something else. If it was all in one giant bag, I’d never now that I had a shorted or mixed up grain bill. Some grains (caramel malts for example) already have their starches converted, so there’s no need to mash them to extract their potential. Instead you can just add them at vorlauf time and get their effect without risk of extracting extra harshness. This method works exceptionally well with black malts. To get a good understanding of your recipe and relation to the finished product, it can be useful to get a crunch on a kernel of grain or two, knowing what it is. Knowing what a particular malt tastes like may help you distinguish that flavor in the finished beer. It might be something you love and want to keep around, or it might be something you don’t like and want to exclude from future batches. So although you might feel high maintenance to get it all bagged separately, there are good reasons to do so. And if your homebrew shop gives you the option of selecting that while ordering online, it’s as simple as one click. I was trying out an electric all-in-one brewing system, and appreciating the fact that I could brew indoors, meaning I could brew in the evening. Not having to fumble around in the driveway in the dark with a flashlight was part of the appeal of going electric. So my brew day went a bit longer than planned and there I was about 11:30 at night, finished with my brew day, and trying to clean up. So I proceeded to scoop out the aftermath of 11 lbs. of spent grain into the sink. I was a bit alarmed at how much that pile of grain filled up the sink, but I was tired and eager to finish up the brew day. I turned on the faucet and started running water and scooping grain into the disposal while it was running. I figured as long as I washed it with a lot of water, and took it slow, I’d be fine. I soon found that I wasn’t fine and the drain wasn’t clearing. I brought out the plunger, but it didn’t help. In the end I had to do what I was trying to avoid in the first place and scooped the grains out into a bag. But I also had a clogged sink as a bonus. I had hoped that after sitting overnight it might somehow magically clear but it didn’t. 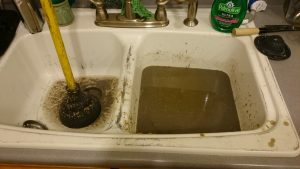 The next day I had to take the pipes off under the sink to clear them out and snake them a couple times before finally getting it to clear. Lesson well learned as to the limitations of the kitchen sink garbage disposal. 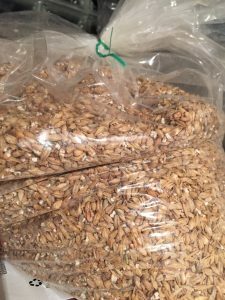 If you crack your own grains (and I recommend you do- see my opinion why), here are a couple of tidbits I’ll pass on that I learned the hard way. They both have to do with roller adjustment. 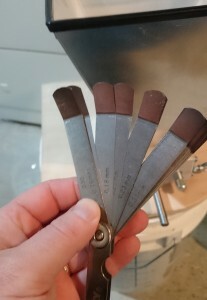 When I first got my grain mill, the instructions suggested getting a set of feeler gauges to set/adjust the roller gap to, in order to define your grain crush. I thought this was a superfluous detail and I would just eyeball it. I found after my first setting was too large that it was actually quite hard to tell by eye if the gap was the right size to crack the barley husk without pulverizing it to dust. Really the only way to tell was to run a batch of grains through and look at what was coming out the other side. If too much or not enough, adjust accordingly. Making these adjustments by eye was quite tedious as I would continually overshoot or undershoot my mark. In the end, my efforts to try to simplify things by skipping the feeler gauges was actually making it harder for me. So I bought a set and figured out what seemed to be the right setting. In the process of these adjustments, I got burned by the lock nuts on the adjustable roller. The mill was set up with a dial on both ends of one roller to dial it in closer or further away from the other roller. Then it had two locking screws to turn in tight to keep the roller in position. Stupidly, these locking screws have a nut threaded onto them, that cause you to bottom out your tightening screw against the nut and not actually be locking the roller into position. I found this out after seeing a batch of kernels go through and not actually get crushed properly. I have no idea the intended purpose of these nuts. I had initially thought they were to keep your adjustment screws from backing out once you locked them in, but that’s not the case. 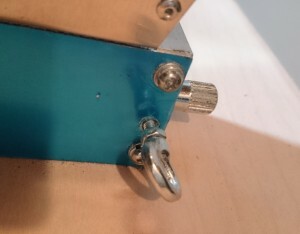 They way they’re set up, they only function to prevent you from fully locking your adjustable roller into place, but don’t prevent your roller from backing out and increasing the gap as you grind. So word of advice, just back these nuts way off and get them out of your way so you don’t get burned like I did. About a year ago, I decided to buy a grain mill and crack my own grains. I figured if I tried to explain it to anyone they’d think I was crazy spending $100 for a grain mill to add another labor step to my brew day preparation when the homebrew shop would do it for free. At the time I did it because I was feverishly trying to sort out my grain conversion efficiency. I had a particular batch that had a low conversion efficiency, and after inspecting the spent grain after mashing I noticed a lot of the kernels were still intact, and hadn’t even been cracked. I decided if I really wanted to be in control of what was going on, I couldn’t be victim to whether or not my grains were fully cracked coming from the homebrew shop. Ever since making that decision, I’ve felt it was money well spent as I felt more in control of the whole process (which is partly what drives us all to move from extract to all-grain to begin with). 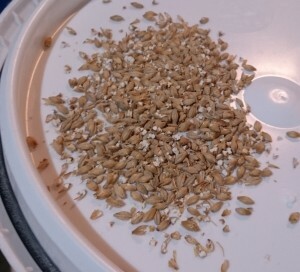 While cracking a batch of grain recently for a Scotch Ale, I would crack the grains and inspect to make sure I was getting a good crush- cracking all/most of the hulls but not turning things to powder. 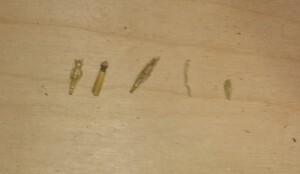 All was going well as I worked through Munich, White Wheat, and Smoked Wheat. But when I went through the Golden Promise, I found that maybe only 50-60% of the kernels were cracked. I adjusted the roller to do a finer crush and re-processed it all. In hindsight, if I was smart, I would crush all of a given grain in a bucket then then after inspecting the crush move it over to the brewday grain bucket. But in this case, having not learned that lesson yet, my half-cracked Golden Promise sat on top of the rest of my nicely crushed other grains. Having no option but to crush it all again on the finer setting, it all went back through the mill. I got a nice crack on the Golden Promise, but a lot of the other got broken up into very small bits. 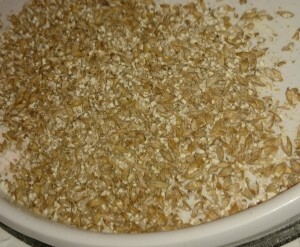 I added some rice hulls to help avoid a stuck mash with such a fine crush and was prepared for brew day. Had this batch come through my LHBS, I’m sure it would’ve all been run through a fixed roller setting and I’d be stuck with low conversion efficiency. While cracking this batch of grains, I found another reason cracking your own grains is worthwhile. 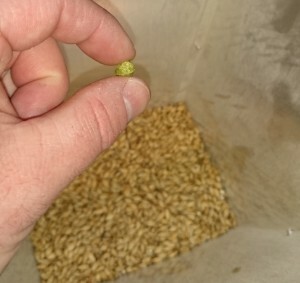 Frequently while going through this grain processing you find little bits of bonus grain bits that you can filter out (grain stock other than the kernel), but this time I found an unknown hop pellet sitting in my package of grains. I have no idea what type it was, how old it was, etc. I just know I was glad I found it and it didn’t get ground up to be a bonus/mystery flavor in my Scotch Ale. Making a small 2.5 gallon batch that was also low in IBU, one hop pellet could make a noticeable difference. If you’re doing a multi-temperature mash by adding heat to your mash tun, you need to be wary of heat plumes fooling your thermometer. I have an 8 gallon pot with a false bottom that I use for my mash tun. When I do a multi-temperature mash, I monitor the temperature of the grain/water mash as I’m adding heat. Occasionally I’ve been thrown into a panic as my temperature seemingly shot past my target temperature. However, if you’re not running some sort of recirculation pump you need to be wise to these tricks and give your mash a stir to ensure the hot water at the bottom gets mixed in to the entire mash instead of just finding an escape route to the top past your thermometer probe. Similarly, when first mashing in your grain to your hot water, you need to give it about 5-10 minutes to totally equalize and balance out the temperature between grains and water before trying to adjust temperature up or down. 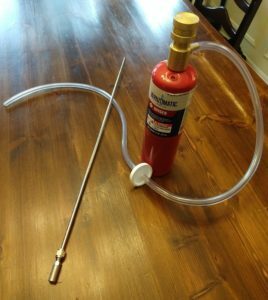 I’ve had situations where it was location of the thermometer probe giving me an inaccurate temperature, or sometimes just simply giving things a chance to fully mix and stabilize. One side this homebrewing hobby that can be both a blessing and a curse is the amount of time needed on brew day or preparation for brew day. Of course this time alone can be a great escape from the stresses of life. And sitting outside on a nice summer day watching my wort boil and listening to the birds sing I find downright magical. But telling the kids, “Not now, I’m busy” can make even the most solitude-loving individual feel guilty. So facing a giant mass of equipment I needed to clean on Saturday afternoon in preparation for a Sunday brew day, I came up with a brilliant idea. 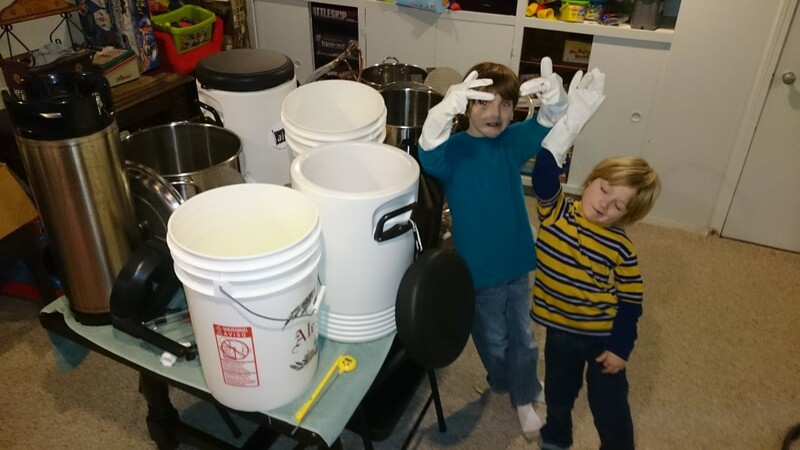 I conscripted the young helping hands I had at home, telling them I’d pay them $5/hour to help me clean my brew equipment. It was a win-win. The kids were thrilled to be earning some money to spend on whatever they wanted, they helped me get through cleaning day faster, and instead of this work being alone non-family time we were hanging out having fun listening to music and talking. Luckily, the kids weren’t up on child labor laws and the concept of minimum wage, so I think I’ll pursue this again in the future sometime.